More than 23 million children and teens in the U.S. are considered obese or overweight, a statistic that experts say is a national epidemic. The National Childhood Obesity Awareness Month (COAM) recognizes September as their month to take a stand and fight childhood obesity. Rising numbers have tipped the scales in all age groups, but 1 in 3 children (ages 2 to 19) are considered overweight or obese. Fighting those statistics locally are the owners of Bossier Olympiad, who have spent the last 40 years doing their part to keep kids fit both mentally and physically. Bob and Willa Moss promote healthy lifestyles and physical fitness in a fun, exciting way. 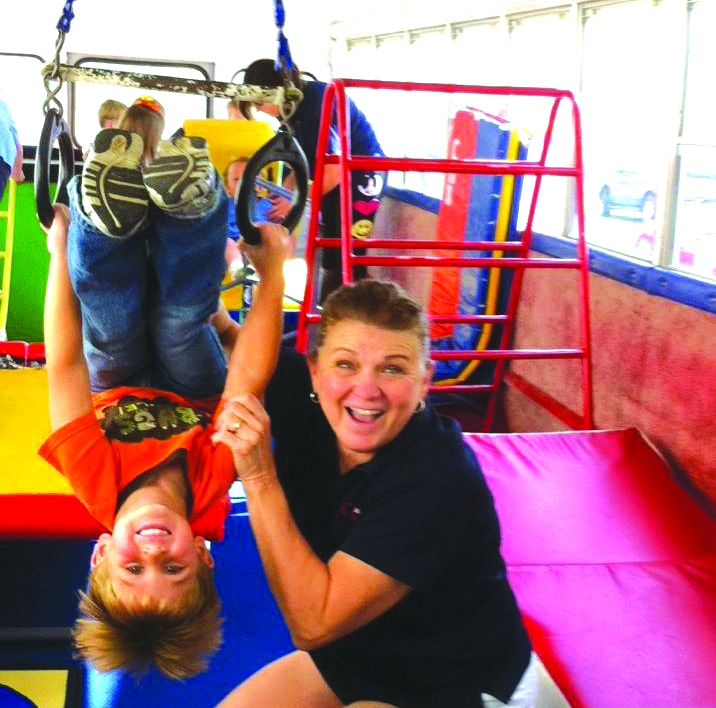 Their Tumblebus has become a staple in daytime routines for children in Bossier and Caddo Parish. Willa Moss said the bus serves as a child’s personal trainer in a scaled down gym environment. “This is a really unique concept. We’re only the second in the country to do it and we’re now in our 23rd year,” she said. Once a week, the Tumblebus visits local childcare centers and schools for a 30 minute preschool gymnastics lesson. The bus is a renovated school bus, complete with a padded floor, carpeted walls, air conditioner and equipment that help children learn the basics of gymnastics. “Keeping a healthy body is fun. We want to instill that mindset early on,” Moss said. Childhood obesity can have a harmful effect on the body in a variety of ways. The CDC says that obese children are more likely to have high blood pressure and high cholesterol, which are risk factors for cardiovascular disease. The Tumblebus is part of Bossier Olympiad’s Tumblebears preschool program, which provides children (ages 2 to 5) a new approach to long term health and fitness activities. Their ultimate goal, Moss said, is to help children develop into happy, healthy and fit adults. Moss added that their programs, particularly the Tumblebus, are geared toward promoting self-esteem and confidence. The Tumblebears program is also used to develop fine motor skills, including balance, jumping and coordination, through activities like the balance beam and trampoline. Moss said it’s crucial to build a strong body and healthy lifestyle early in life. Once they age out of the Tumblebears program, Bossier Olympiad offers gymnastics programs for boys and girls at their gym, located at 2385 Airline Drive in Bossier City. They also have an array of family fun activities, including laser tag and a four-story indoor playground. Nearly five percent of children and teens now fall into the “severely obese” category, according to the American Heart Association, and at higher risk for premature heart disease and type 2 diabetes. Moss emphasized the importance of keeping the mind and strong, but doing both safely.